The article provides facts and information about Native American Groups. 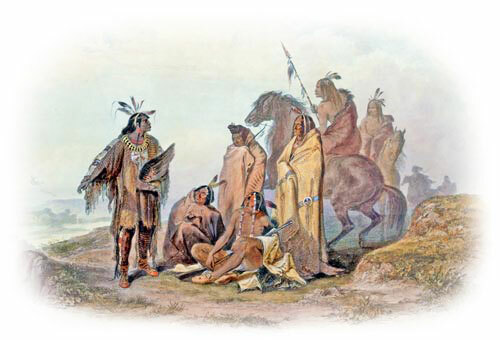 Scholars have organised the Native American Indians into ten primary groups which are separated by location and categorised as the Great Plains Indians, the Northwest Native Americans, the Northeast Woodland Indians, the Southwest Indians, the Southeast Native Americans, the Great Basin Indians, the Plateau Indians, the Arctic and Sub-Arctic Indians and the Native Americans of California. The culture area or group concept is based on cultural traits and the effect of geographic influences on those cultures. The locations of all of these American Indian cultural groups are shown on the Map. The culture groups of American Indian tribes are categorised according to the divisions of Native American Groups as illustrated on the map and details of the culture of these people living in the areas are detailed below. 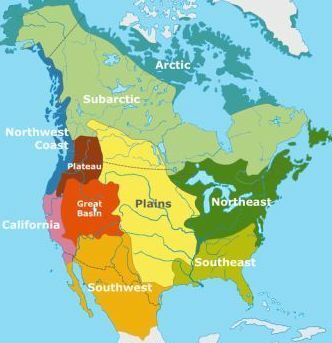 The groups are categorised as Northwest Native American groups, the Northeast Woodlands Indian groups, Plateau Indian groupd, Great Basin Native Indians, the Great Plains Indians, the Southwest Indians, the Southeast Native Americans, the Arctic and Sub-Arctic Indians and the Native Americans of California. Housing: Tepees were used by the nomadic hunters. Geography: Heavy rainfall, tall dense forests, oceans, mountains and rivers. Discover the vast selection of pictures and videos of the people who spoke the Native American Groups of Native Americans. The pictures show the various tribes and Native American Groups as a really useful educational resource for kids. Our series of videos enable fast access to the images, pics, paintings and pictures together with information and many facts. We hope that this article on Native American Groups will assist in your studies or homework - a great educational resource for kids on Native American Groups.